Sausage topped with grilled onions and peppers at Links Taproom. 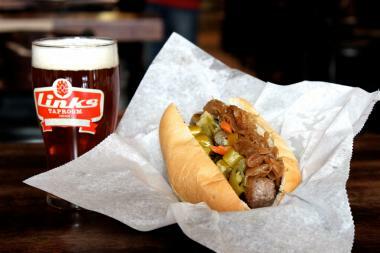 WICKER PARK — A bar specializing in craft and cask beer along with several varieties of sausages and hand-cut French fries plans to open Saturday just south of the Milwaukee, Damen and North avenues intersection in Wicker Park. Located in the former Bin Wine Cafe space, Links Taproom, at 1559 N. Milwaukee Ave., is owned by Michael Quinlan and Cary Michael, formerly with Branch 27, Rockit Bar & Grill, and Lettuce Entertain You. Described as "an All-American craft beer and sausage-focused neighborhood bar," Links will serve 35 craft beers by draft, four cask beers, and 50 craft beers in bottles and cans. Breweries include Une Anee, Founders, Firestone Walker, Greenbush, Dark Horse, Green Flash, New Holland, Revolution, Jolly Pumpkin, Half Acre, and more. To anchor all those libations, Links will offer sausages, hand-cut French fries and bar snacks created by consulting chef Joe Pierro of Big Onion Tavern Group and Lance Avery of Big Fork Brands. Link's hand-cut fries will offer "dipping sauces" like bacon apple butter, bourbon BBQ and garlic pesto. The “Buried Alive” fries will be covered with sausage, hot peppers, bacon, sharp cheddar, and jalapenos. Guests will order food from a kitchen counter and be given a customized beer tap handle as a table marker, and their food will be delivered to their seat at the bar or table. The sausage-focused menu will have eight different links, including Chicago Steak & Ale, made with sirloin, bacon, Bell’s Amber Ale and horseradish. A Bratwurst link will contain veal, pork shoulder, toasted spices and whole milk. Other sausages include a "3 Chile Chorizo," with pork shoulder, jalapenos, chipotle and Habanero peppers, and a Vegan link made with Portobella mushrooms, black beans, and tamari, a Japanese soy sauce. All sausages will be $7 each and include two toppings (beer onions, Giardiniera, cheese sauce and cider-braised cabbage, among others), while "bar snacks" (beer cheese soup, fried cheese curds, fried pickles, hot pretzels, roasted peanuts and chili) range from $4 to $8. Draft beers — offered in 9 and 13 ounce pours — will range from $3.50 to $9.50 per glass. “Great beer, great sausages, and great fries all in a laid back neighborhood bar is what Links is all about,” Michael said of the bar, which can accommodate about 80 patrons. To add to the beer theme, the bar uses beer growler light fixtures and incorporates old beer kegs into its decor. Beer bottle caps are embedded into the floor, with more beer-related decor such as signs, stickers, and labels planned for the future. For those looking to watch sports, Links will have five flat-screen TVs, but you won't find them above the bar, which will instead showcase DigitalPour screens displaying which beers are on tap, the brewery name, price and how much is remaining in the kegs. Customers will be encouraged to “check-in” on Foursquare and use an Untappd beer app to share updates on what they are drinking through Facebook, Instagram, Twitter, and Foursquare. A live feed will be displayed at the top of the DigitalPour screens. For those looking for cocktails, Links will have a limited liquor bar due to the fact the beverage program is focused on craft beer. There will also be five wines (two reds, two whites, one prosecco) on tap too. Michael said a weekend brunch food menu that will supplement the regular food menu will roll in a few weeks after the opening. Links Taproom, 1559 N. Milwaukee Ave. Hours are 4:30 p.m. to 1 a.m Monday-Thursday; 4:30 p.m. to 2 a.m. Friday; 11:30 a.m. to 2 a.m. Saturday; and 10:30 a.m. to 1 a.m. Sunday. Ph: 773-360-7692. Follow the bar on Facebook or Twitter at @LinksTaproom.